It can be argued — and with much validity — that the introduction of body-worn cameras in the last decade has had more impact on American policing than any other tool since the car radio. They have changed the way evidence is collected, the policies of many law enforcement agencies, the way the media covers controversial police incidents, the way the public interacts with officers, and, in some cases, the way officers interact with the public. 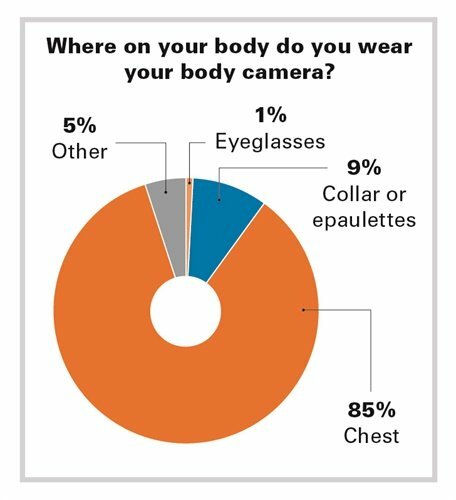 The editors of POLICE Magazine wanted to know more about the impact of body cameras on our readers, so we sent them a survey last month. Response was not strong enough to be definitive, but it does provide some insight into how body cameras are being used, where they are being used, their upside, their downside, and how officers feel about the devices. The first question was an elimination test. It asked respondents if they have had experience wearing body cameras while serving as law enforcement officers. And it showed that body camera usage has yet to reach critical mass. Out of 779 respondents, only 422 or 54% said they have worn body cams on the job. The rest of the responses came from those 422 officers. Body cameras have become so important in contemporary law enforcement in a very short time that of the readers who responded that they are using them, 81% said they were required to use them by their agency. That puts these devices in the same category as uniforms and radios and duty guns. They are mandatory kit. We also wanted to know how long the agencies where our readers work have fielded cameras. The most popular answer was three to less than five years, followed by one year to less than two years. This shows that the technology became widely accepted in the last five years and many agencies have only recently implemented their body cam programs. But some officers were using body cameras on the job even before their agencies started mandating them. 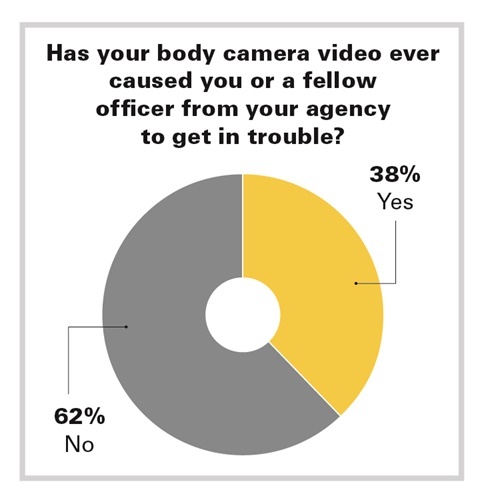 Nearly 20% of respondents said they had used a personally owned body camera before their agency provided one. In addition, 59% of respondents said they had used a personally owned or agency supplied audio recorder in the field to capture evidence other than interviews and protect themselves from false claims. There's no doubt that body cameras have become a standard piece of equipment for American law enforcement. And the vast majority of the respondents, 88%, said that's a good thing. Our survey also shows there is some truth to the belief that body cameras have affected the way both officers and civilians interact. Asked if wearing a body camera on duty has changed the way they interact with the public, 23% of respondents said "yes." Asked if it's changed the way the public interacts with them as officers, 38% of respondents said "yes." 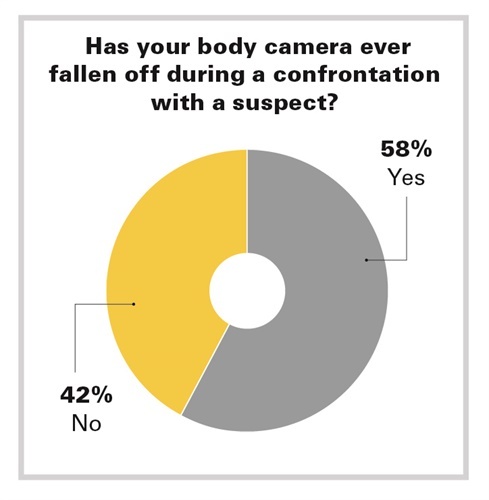 We wanted to dig a little deeper into this issue so we provided the respondents an opportunity to anonymously tell us how body cameras have changed such interactions. From the officer side, here' s a few responses. "It is a constant reminder for me to be professional," one officer wrote. Another was considerably more blunt: "It has stopped me from being rude at times," the respondent wrote. Another wrote about how the camera has changed the process of doing the job. "You ask questions you wouldn't have asked before because you want that information recorded," the respondent wrote, adding that it has become routine to narrate the actions taken by the officer and to hold up documents and evidence in front of the camera to capture them on video. Evidence capture was on the mind of another respondent who wrote: "When dealing with difficult individuals, I will stand there longer to be berated to enhance the case against them." Perhaps the most disturbing statement by any of the respondents was: "I feel less safe because I am afraid of using force because of how it will look on the camera." We also gave officers an opportunity to tell us how body cameras have affected how the public reacts to them. Some said they gain more compliance and face fewer enraged subjects. Others said that effect can be temporary. A common implication was a body camera has a calming effect on more rational individuals; it doesn't on drunks, subjects on drugs, and people who are just generally belligerent. One effect that multiple respondents mentioned is that some people who might have spoken with the officers in the past won't do so on camera. Many agencies have policies that allow officers to turn off the cameras in such situations. But the presence of the camera, even if it's off, is enough to make some people hesitant. 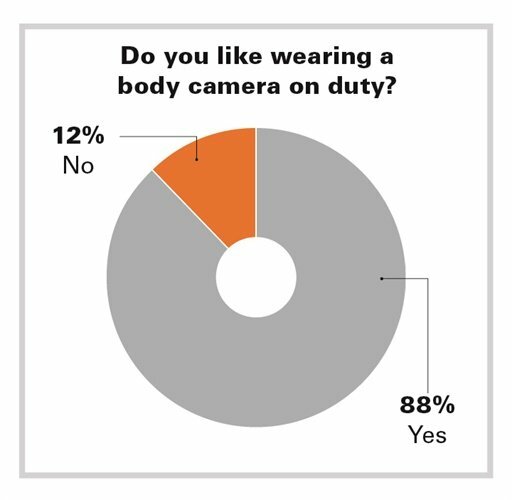 Despite such concerns, most officers who responded to our survey said they like wearing cameras. And the reason why became very clear when we asked if evidence captured by a body camera has ever cleared the respondents of a false claim. A whopping 45% said their body cams had saved them from such claims. This is another issue that we wanted to explore more deeply. So we let officers tell us what happened. There were claims of racial slurs, sexual misconduct, unprofessionalism, rudeness, excessive force, and many other false allegations. A supervisor wrote: "I have yet to substantiate a claim against an officer after reviewing their camera." For the flipside of officers being exonerated by body cameras, we asked, "Has a body camera video ever caused you or a fellow officer from your agency to get into trouble?" More than a third of respondents answered yes to this question. We did not ask them to elaborate. From the beginning of the body camera era and especially post-Ferguson, agencies have faced a lot of concerns about drafting body camera policies acceptable to officers and the public. We asked a series of questions on this topic. 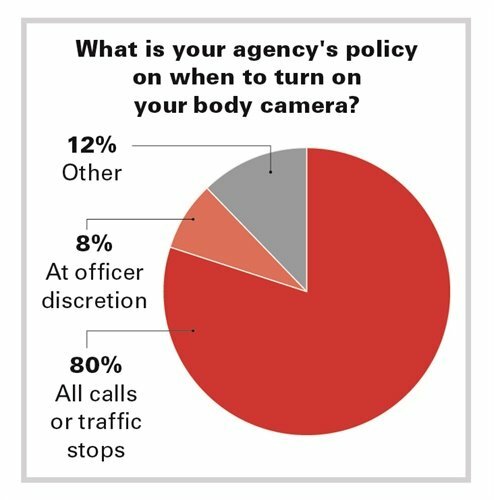 Most respondents, 80%, say their agencies require them to turn on their cameras during all calls and traffic stops. 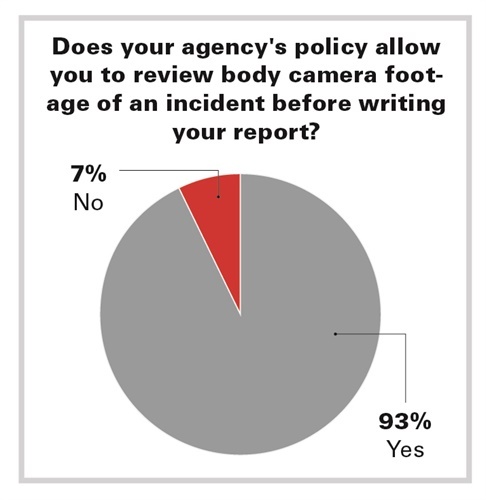 On another policy issue that is often controversial, 93% of respondents said their agencies allow them to review their body camera footage before writing their reports. Documenting police response with body cameras is not a perfect science. Many people do not consider the human factor of having to remember to turn on the camera often in situations of great stress. Human error happens and often at the worst times, which is why 86% of the respondents to our survey say they have forgotten to turn on their cameras when policy would require them to do so. And the reverse is true as well; 81% of respondents say they have forgotten to turn off their cameras after a call or contact. This can be a cause of great concern for body camera wearers because there is no way for the wearer to delete the file. So officers have accidentally recorded private conversations, moments of personal exasperation they would never want the world to see, and even trips to the toilet. To eliminate human error when activating body cameras under stress, some companies have developed products that automatically activate the system when the officer draws his or her duty weapon. In our survey, a slim majority of 37% of respondents thought this was a good idea and they would want to have it available. But an almost equal number of respondents, 36%, said they were not sure if they wanted a holster to activate their camera when they draw. Another technology that is starting to gain some traction in the world of evidentiary video is the gun camera. We asked our readers: "Would you want a camera on your duty weapon if it didn't interfere with draw, holstering, aiming, or the balance and feel of the gun?" The "No" voters were in the majority on this one at 37%, but it was a very slim margin. Coming in second at 32% was the "Maybe" vote. And those who approved of the concept tallied 31%. The single greatest expense and technological headache for agencies implementing a body camera program is file storage. So we wanted to know how they are storing their data and the issues they are having with it. Even though the cloud is often more discussed in body camera presentations and articles, most of our respondents, 52%, said their agencies use in-house servers for video storage. The cloud was used by 41%. Some officers, 7%, did not know how their agencies store the videos. As for issues with storage, we were not surprised that cost was the most common answer. Another issue that was mentioned a significant number of times was speed, both of downloads and of access. One respondent wrote: "Our videos have to upload wirelessly to the server, then 'rescramble' the data, and then encrypt the data. It can take hours before we have access." 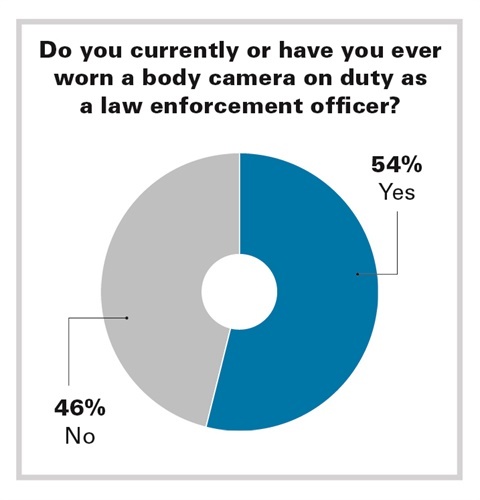 The final question we asked in this survey was about the benefits of body cameras. 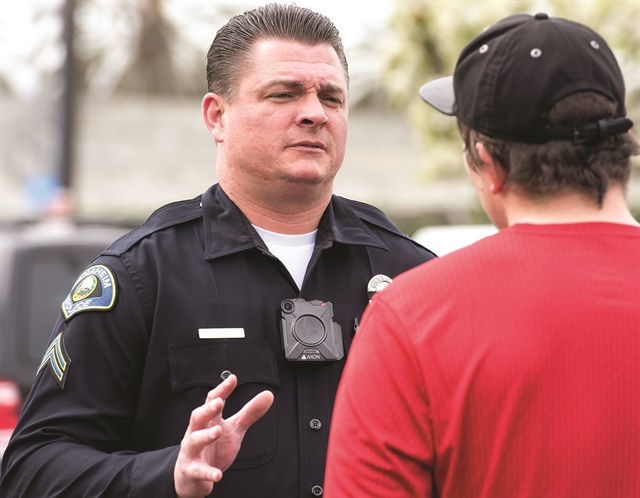 It was clear from the answers that even though many respondents believe body cameras can be a hassle and they do have drawbacks, that the benefits far outweigh the downside. Clearing officers or false accusations and reducing liability was a common response to this question. Others praised the evidence capture capability of the devices for their crime solving ability, saying their devices have recorded at the scene confessions. A number of respondents said the cameras help officers de-escalate situations with more rational subjects because they don't want to be recorded acting up. Officer safety was another respondent's answer: "I can focus more on potential threats, while the subject/suspect is talking instead of taking notes and focusing on minor details."